An app for selecting and developing color themes. 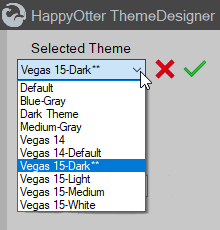 A variety of presets are available including the new Vegas 15 dark theme which is shown. The user is also free to “design your own” theme. 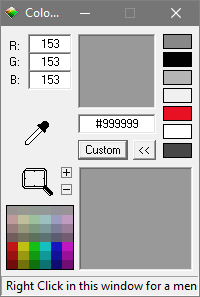 There is also an information panel which describes how to use the ColorCop color selection tool. Selected Theme . A drop down list from which to select the HOS color theme. Left-click deletes the selected theme. Left-click sets the selected theme as the Default Theme. The Default Theme will be applied whenever a script is launched. Launch ColorCop . ColorCop is an app for getting color information using an eyedropper or the normal Windows color selection tool. 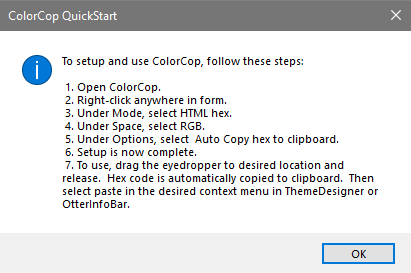 Left-click on the help button to launch the ColorCop QuickStart Guide. Update Theme. Once a theme is loaded it may be edited by selecting different colors. Once editing is complete, a left-click on the Update Theme button will update the selected theme. Add New Theme. A new theme may be added at any time by left-clicking on the Add New Theme button. Once the button is clicked, a new theme name may be entered into the info box. To save left-click the green plus icon. To cancel, left-click the red minus icon. Reset All. Loads the default template. Select Toolbar Colors. To change the background or text color of the taskbar, first select the new color using ColorCop. Then right-click to bring up the context menu. Left-click Paste Background Color to change the background color, Paste Text Color to change the color of the text, or Reset to exit. The ToolBar background and text will change to reflect the new colors. Select Background Colors. To change the background or text color of the main GUI, follow the same procedure described in #6. Customize Groupbox. If checked, an option becomes available to change the background and text colors of the Groupboxes within the GUI. Follow the same procedure described in #6. Theme Preview. A sample GUI used to show the effects of color changes.